* How con I overcome my need for control? * Do all ACOAs ploy the some kind of roles in the family? * How do I overcome my fear of intimacy? * What is all-or-none functioning? * How can ACOAs maintain self-confidence and awareness after recovery? * How do ACOAs handle the family after understanding its influence? * And many other important questions about your post, family and feelings. Written with warmth, joy and real understanding, Recovery will inspire you to meet the challenges of the post and overcome the obstacles to your happiness. Awareness If you only read one book on adult children of alcoholics this year, make this the one. Timmen L. Cermak, M.D. President, Notional Association for Adult Children of Alcoholics Gravitz and Bowden provide the first practical guide for adult children of alcoholics. Their creative description of the stages of recovery is especially useful. At lost there is a rationale for deciding what issues and what treatment services ore most relevant to each individual. Adult children of alcoholics will feel they have mode two new friends by the time they have finished this very readable book. Robert J. Ackerman, Ph.D. Children of Alcoholics Dr. Gravitz and Ms. Bowden have definitely filled a much needed area for adult children of alcoholics in their new book. This is the first book that attempts to answer many of the 'silent' questions of the millions of adult children of alcoholics in our society. Their years of experience, perceptions and sensitivities are obvious in this well-thought-out book. Herbert L. Gravitz, Ph.D., is a Clinical Psychologist in Santa Barbara, California. He is a founding Board Member of the National Association for Children of Alcoholics (NACOA), and currently serves on the Advisory Board. He was Executive Editor of "The Network," a publication of NACOA and authored the Children of Alcoholics Handbook. Julie D. Bowden, M.S., is a Marriage, Family, and Child Psychotherapist in private practice in Santa Barbara, California. She developed the first Alcohol/Drug Awareness Program for the University of California system and has consulted on both inpatient and outpatient recovery programs. She is a founding Board Member of the National Association for Children of Alcoholics (NACOA), and its first treasurer. She currently serves on the Advisory Board. She is the adult child of an alcoholic. Together, they conduct recovery retreats, individual and group psychotherapy, and educational seminars for adult children of alcoholics as well as other adult children of trauma and the professionals who serve them. They began the University of California's first therapy group specifically for adult children of alcoholics. They have authored numerous articles and are coauthors of an upcoming book, Genesis: The Spiritual Dimension of Recovery for Children of Alcoholics and Other Children of Trauma. It's a shame that more of those in recovery from drugs and alcohol don't read this book. This should be a guide for steps 8 and nine. I am in recovery and when I mention the ideas in this book, I often heard, get over it. I have yet to hear anyone in AA or NA share the depth of hurt they caused their families as discussed in this book. If those in recovery would read this book, they might realize how much they owe their families. Insurance companies pay for addicts to recover, but they do little to help the families who have suffered by living with the addict. I use the word addict to refer to those who are addicted to alcohol as well, because alcohol is a drug. Too Bad Bill Wilson, who was a womanizer, didn't call himself an addict and too bad, he didn't share about the emotional abuse he administered to his wife Lois. Above all, the authors tell us "You do not owe them (parents and siblings) the information, and you do not owe them the confrontation ... you need your energy for your own recovery, your own healing. That is the only place you can be assured of success" (page 82). Warning to readers: if you share these ideas to family or those in recovery, expect denial and a cold shoulder, but read it anyone. "Toxic Parents: Overcoming Their Hurtful Legacy and Reclaiming Your Life"
by Susan Forward and Craig Buck, Jan 2, 2002. 5.0 颗星，最多 5 颗星Very enjoyable, recommended ACOA literature. I'm halfway through this book. I'm writing the review now because it's already one of my favorite pieces of ACOA literature. The book has a question and answer format. It covers very important topics that I thought were helpful like the chapter on emergent awareness. Some questions come out when you discover how big the trauma you endured was. Can I bring this information to my family to save them? Is being ACOA the reason for all of my problems or none of my problems? How do I move forward when I receive this clarity? How do I go about finding a counsellor? Often the book poses these thought-provoking questions and answers them, and it answers them with some beautiful language. Some things are so clear, and speak so well to me that I can't help but enjoy the whole of the book. The book advises that you pick it up and put it down again so as not to overwhelm yourself with too many new thoughts, and it's a very good suggestion. I read between 3 and 5 pages a day, learning a little bit more and more about the disease (this is my third ACOA book, by the way). It's a very short book at around a hundred pages. I think that's why it's so nice to just pick it up every now and then. I don't want it to end too quickly. If you have questions about why you act the way you do after growing up in an addicted family system, this might be a great starting point for someone. I always knew what the problems were growing up. Fortunately, I never blamed myself, unlike others often do. But I never really understood how it all affected me, my personality development, my outlook on life, and how I perceive and react to other people. You bet I engage in "black and white thinking" as the authors discuss. After reading the book, I realized I have been "in recovery" for the last 22 years and just did not know it-- it began with my moving to the next state, and having less contact with toxic family members. For most of my adult life, I have removed myself from situations where people act like jerks to me, instead of cutting them slack or putting up with bad behavior-- I think it's the recovery and my instinct to protect myself-- I am no longer the scapegoat like I had been in my family. This book was eye-opening for me and I think it will be for anyone looking to understand what their role in their family was and how it has shaped them as a person. Not going into a long drawn out review here, I never review anything just because it's just not me. But this book has revealed to me the entire story and meaning behind my childhood and adult life being an adult child of an alcoholic family. Knowing what happened and WHY I became the way I did has been more help than studying the literally hundreds of self-help/personal development books since my late teens. Knowing the dynamics of my entire upbringing and how it affected me from the very start has been nothing short of life changing! I can't guarantee it will be the salvation for you that it has been for me. But it can finally put a name to a lot of the things you probably have thought were just you being screwed up. BIG thumbs up! The book is written for beginners who are just discovering the roots of their problems. It is designed to answer questions, thus the chapters are subdivided using questions instead of pure theory. It is easy to read, addresses main issues of ACOA and directs the reader to seek help further. I often find myself lose attention reading a book that is pure theory without examples, but throughout the book the authors give multiple examples which makes the read easy to apply to your own life. 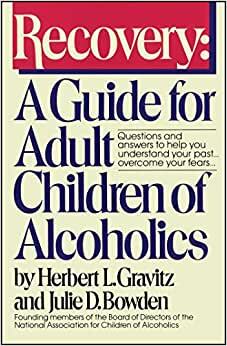 Even though it is written in the 80's, the book demonstrates what adults children of alcoholics go through even in the present day reality. Years go by, but the psychological trauma of alcoholism in ACOA remains similar to what it has been since the 80's.